Norway now has not only one top-ranking official trying to keep the peace on Cyprus, but two. Just a week after General Major Kristin Lund made history by becoming the first woman to lead a UN Peacekeeping operation, on Cyprus, former Foreign Minister Espen Barth Eide was appointed as the UN’s Special Envoy to Cyprus. Both Lund and Eide will thus be trying to keep the peace and, in Eide’s case, settle a decades-year-old conflict between Turkish- and Greek Cypriots. Current Foreign Minister Børge Brende said Eide, who became a director of the World Economic Forum earlier this year, would have “the full support” of the Norwegian government in his work. 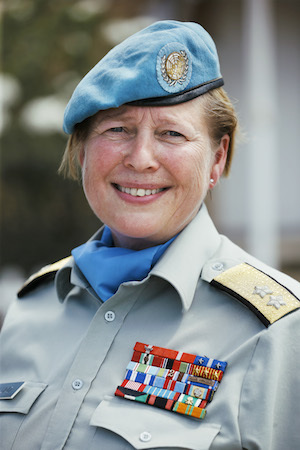 It was Lund who was getting most of the attention this month, though, as she assumed her new command of the UN military forces on Cyprus, based at Nicosia. She was appointed by UN Secretary General Ban Ki-moon in May and had her first day on the job August 11. Lund, age 56, told newspaper Dagsavisen before leaving Norway that she never had any desire to change the world. During her successful military career, however, she has ended up reaching the top levels in a man’s world, becoming a general in the Army and now a UN commander. She’s spending time now visiting various part of the large island in the eastern Mediterranean, getting acquainted with literally thousands of new UN colleagues and settling into the UN mission’s plans and assignments. The UN operation on Cyprus is in its 50th year of monitoring a ceasefire between the Greek- and Turkish Cypriots, and controlling the buffer zone between the northern and southern portions of the divided island. The goal is to find a long-term political solution, which is what Eide will be working on. Lund has different duties and she claimed the UN mission has lasted as long as it has because of “good routines” along with the challenges. She thinks it’s an advantage to come from Norway, which is often seen as a neutral country. Her assignment is only for one year, with an option for extension. Lund, who has a master’s degree in strategy from the US War College and graduated from Norway’s military academy, has served overseas previously, leading ISAF’s civilian-military cooperation in Afghanistan and serving in Saudi Arabia during Operation Desert Storm. She also has worked for the UN in the Balkans and in Lebanon.